Bushnell E3940 Elite 3-9x40 Multi-X Reticle Riflescope E3940 FREE SHIPPING! 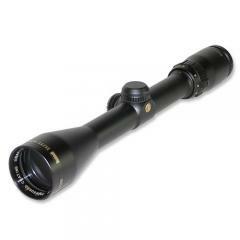 The Bushnell Elite 3-9x40 is a versatile riflescope that can perform in a range of applications and environments. Its tough one-piece aluminum tube comes with O-ring seals and an argon gas filling, making it completely impervious to water as well as fogproof. A hydrophobic Rainguard HD coating applied to the external lens surfaces breaks up water droplets to preserve visibility in wet conditions. It is also built for recoil resistance, allowing you to fire powerful ammunition without damage. The scope's fully multi-coated optics come with an Ultra Wide Band Coating for improved light transmission across an extended range of the visual spectrum, providing a brighter, clearer image even in poor lighting. The high resolution view makes it easier to identify and track your target, and the fingertip-adjustable windage and elevation controls make it easy to hit it as well. ©2002-2019 CopsPlus.com: Bushnell E3940 Elite 3-9x40 Multi-X Reticle Riflescope E3940 FREE SHIPPING!